Among the AB community, there’s a pretty commonly held belief that Western makeup is better than Asian. Asian skincare offers far more variety and customization than Western, which is why many of us find that it works better to solve our skin problems, but Western makeup brands tend to offer more color choices, allowing for a greater diversity of looks. Asian brands’ foundation choices are typically limited to a narrow range of pale-to-medium shades, and only a few brands offer point makeup in shades that venture farther than the conventional. I like Asian makeup better anyway. My preferred makeup looks are classic (I’m conventional. Sue me), and since I actually am Asian, I’ve had much better luck finding matches to my skin tone from Asian brands. I’ve had way too many color matching fiascos in my years of making do with Western cosmetics. Here are some of my current favorites! Consider this a preview of my upcoming makeup reviews. 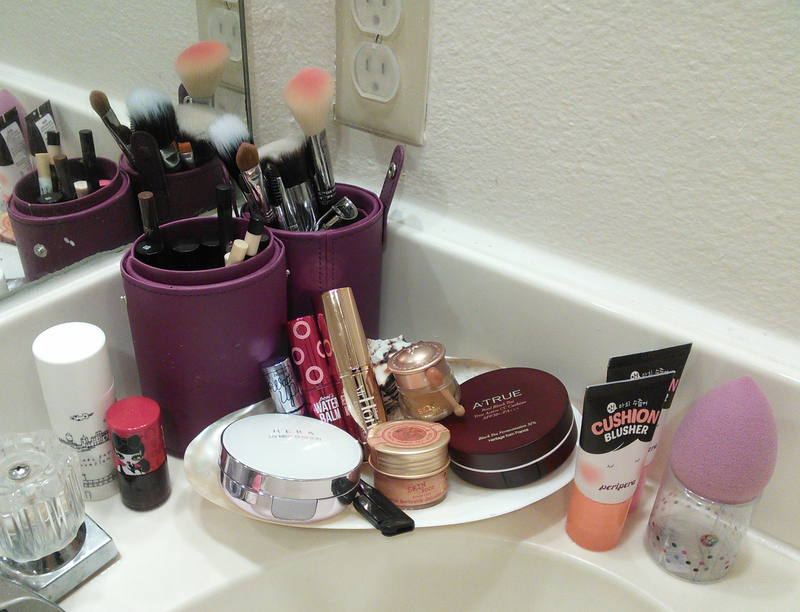 A.True cushions and Peripera products were not made for hiding away in a grubby makeup bag. CUSHIONNNNNNNNS. Oh my God, I regret every day that I spent not using cushion makeup. Cushions have transformed my life. To be honest, I pretty much only wrote this post so I could rave a bit about cushions. The finish of a good cushion foundation is spectacular: sheer, even, dewy, perfectly natural and skin-like, but with just enough coverage to even out skin tone and perfect your look. I have two cushions at the moment and am having a great time trying to figure out which one I like better: the Hera UV Mist Cushion gifted to me from Peach and Lily, or the A.True Real Black Tea True Active CC Cushion sent to me by promising new US-based K-beauty retailer Cupidrop. I’ll be reviewing these cushions side-by-side in the coming weeks. I’ve also purchased a Skinfood Royal Honey Cover Bounce Cushion, which is on its way to me this very minute, and I’m thinking of acquiring IOPE and Innisfree cushions as well. For review purposes, of course. For science. 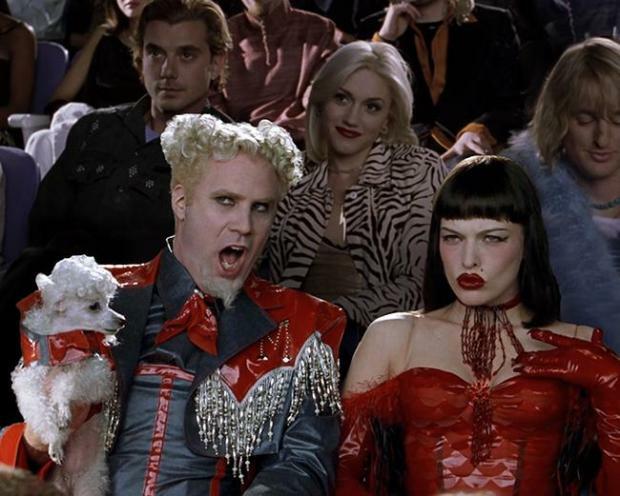 Peripera is SO HOT RIGHT NOW. In my opinion, the brand is right up there with Too Cool for School in terms of both quality and sheer cool factor. I’ve had the peach and lavender cushion blushers for a while now, and Club Clio USA recently sent me two sets of Peri’s Tint Water and Water Balm. The cherry set is my jam. Layering the thin, saturated tint water under the brilliantly pigmented moisturizing balm creates an effect that manages to be both fresh and intense. Love it. Stress tests ongoing, but I’m predicting that my final review of these will be very positive. I picked up the Skinfood Salmon Dark Circle Concealer on a whim during one of my Amazon restocks, and what the hell! How did I wear makeup for two decades without realizing how important undereye concealer can be for a lively, pulled-together look? Blended out from the inner corners of my eyes, this richly emollient but clingy and long-lasting undereye concealer brightens my entire face up somehow, no matter how little rest I’ve gotten the night before. Those sound like great picks and I am looking forward to the rest of reviews! I am very reticent to buy foundation online without being able to check the shades first, so I hope that the trend keeps coming! From what I’ve heard, the Lancome cushion is a bit lacking As far as color matching goes, one thing I really appreciate about the Korean cushions is that they’re so sheer you can get away with a shade that’s not 100% perfect. Do you know your MAC shade? I’m about NC15, your picture looks lighter, NC10? If you’re between NC15 and NC20, you’ll definitely find Korean cushion shades to fit you! Happy shopping! Thank you! Any tips when shopping for cushion shades? I heard that too! The Lancôme cushion is supposed to be a huge fail compared to the cheaper Korean versions. Even compared to the cheaper Innisfree cushions it’s supposed to be a huge disappointment. I finally got Heroine Make Volume & Curl but in the Super Waterproof version. It’s OK layered with Long & Curl, not as much volume as I would like but it works. What I’ve really been liking though is Long & Curl Super Film brushed onto the tips. Oh my, the extra length…well who wouldn’t want some extra length? And I’m enjoying wearing my IOPE cushion and Laneige Water Drop Tints a lot. I FEEL THE SAME WAY ABOUT PONY!!! I’ve never managed to follow along with Western makeup tutorials (even those done by a particular Asian girl) and end up with a look that I felt comfortable leaving the house in. Pony opened up a whole new world of fun-with-makeup for me! I think Shu Uemura was the first Asian cosmetics brand I tried as well, way back in the day–I got their famous cleansing oil. Sadly, it broke me out (I probably wasn’t using it correctly). This time around has been much more fruitful! The IOPE cushion is really good. Both the natural and coverage are great – and I use both depending on what I’m feeling that day. Have you tried the IOPE cushion blush? That is on my short list to purchase. I haven’t, but I’m dying to! Quick question: I’ve noticed that concealer is settling into fine lines around the eyes (it never used too! Argh! Aging!) and I’m wondering if BB cream would be a better option? What are your recommendations, if so? Also, even though I am NW20 in MAC, I received a sample of the Missha 21 Perfect Cover BB Cream and I just tried it today – and I think it looks better on my skin than the NW20! Am I crazy? I’ve noticed that concealer is now settling into fine lines around my eyes (ack! aging!) like it didn’t used to…I’m wondering if BB creams would be a better option for the undereye area? What are your thoughts and recommendations? Also, even though I am NW20 in MAC, I received a sample of Missha’s Perfect Cover BB cream in 21 yesterday and so I tried it today – and I think that the color looks better on my skin than the NW20! Am I crazy? I have noticed that my MAC concealer is starting to settle into fine lines around my eyes (ack! aging!) so I’m wondering if a lighter formula like a BB cream would be better to use around the eye area? What are your thoughts/recommendations? I just tried a sample Missha Perfect Cover BB cream today in 21 and the color is even better on my skin than my usual NW20 MAC concealer color. Am I crazy?